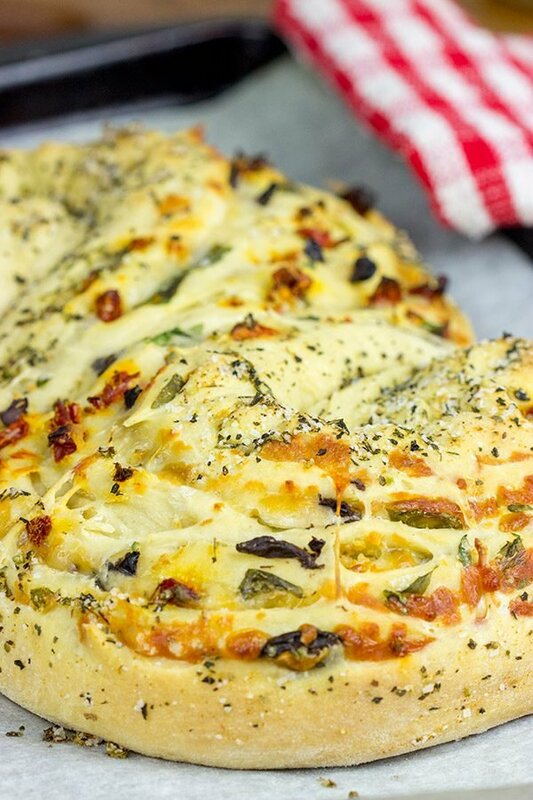 This Stuffed Italian Bread is so much fun to make…and even more fun to eat! 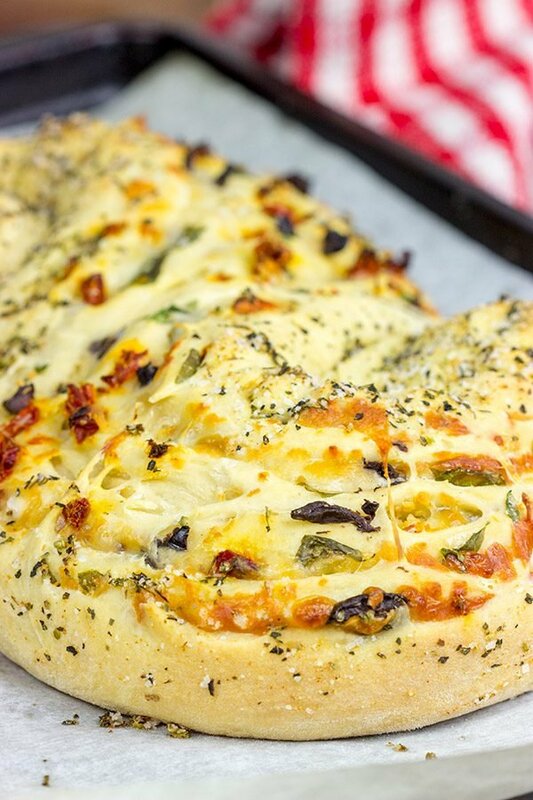 It’s packed with mozzarella, Parmesan, sundried tomatoes and kalamata olives! I’ve said it before, but I’ll say it again. I really love baking bread. We were having dinner with friends recently (I had brought a loaf of this French Peasant Bread to share), and we got to talking about baking bread. They asked why I loved baking bread so much, and I stopped to think. In the end, I think it’s because bread comes from just a couple simple ingredients. Flour, yeast, salt and water. That’s it. Sure, you can add in other flavors, but at it’s core, bread is really very simple. Plus, how those 4 basic ingredients come together to create a loaf of warm, delicious bread is like magic to me! I stumbled across this Pane Bianco recipe from King Arthur Flour recently, and it made me stop and drool think about making my own loaf. So I did just that! I visited King Arthur’s baking center in Vermont several years ago, and I swear that place is like Camelot for bakers. I wouldn’t have been one bit surprised if the legendary King Arthur himself had walked around the corner. They have an amazing cafe there, too…full of, you guessed it, fresh breads baked by Merlin magicians in the back room. But back to this Stuffed Italian Bread recipe. They called this Pane Bianco, which is Italian for ‘white bread.’ This bread is so much more than white bread! I mean I love any and all breads, but the term ‘white bread’ doesn’t even begin to describe this one. Sure, it’s a basic white bread base…but then it gets stuffed with sundried tomatoes, garlic and chopped kalamata olives. (I decided to add the kalamatas here because I love a good olive bread, but feel free to omit them if you’re not an olive lover.) 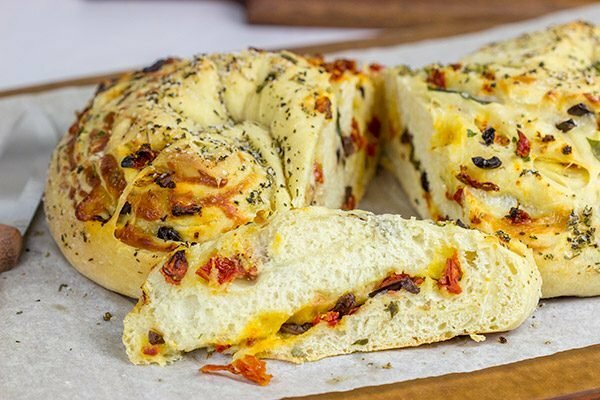 Even Stuffed Italian Bread doesn’t even do this recipe justice, but it’s the closest I could come without calling this “Sundried Tomato and Kalamata Olive and Garlic and Basil Stuffed Bread”…and that’s a mouthful. This bread really made me stop and rethink bread baking, though. Not so much the actual bread recipe, although it is a good one! Nope, this Stuffed Italian Bread made me stop and rethink how to shape bread. Look at how cool this bread turned out! And it’s really rather simple. I just rolled the dough into a long rectangle and then stuffed all sorts of fun fillings into it. Then I rolled it up and shaped it like a big “S.” A quick little snip down the center with the kitchen shears opened up the middle so you could peek inside and see the delicious sundried tomatoes and kalamatas. Plus, as the dough rose for the 2nd time, that little snip down the center opened up to reveal the fillings even more. Fascinating! It was like a delicious present wrapped in bread dough! Ok, I’m sure I’ve convinced you that I am a total nerd. But I love baking bread. I also love eating bread. I find it darned near impossible to turn away from a warm loaf of bread…and then you stuff that bread with tasty fillings? Sold! This Stuffed Italian Bread is now a staple in our rotation, and I’m planning on making another batch to take to our friends’ house this weekend. If you’re not into making homemade dough, you could start with a batch of storebought bread dough…but I challenge you to make your own. It’ll taste way better, and it’s kinda fun to see flour, yeast, salt and water transform into bread! 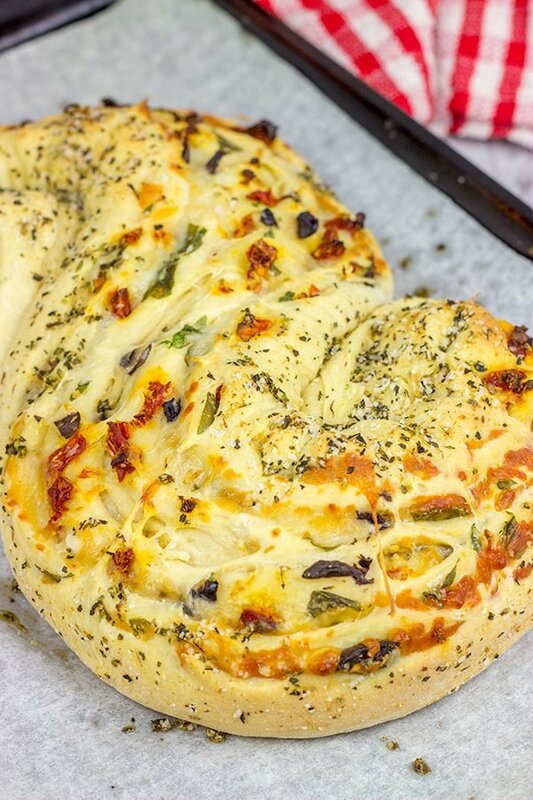 Enjoy this Stuffed Italian Bread, my friends! 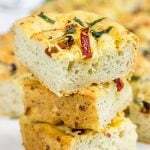 Looking for more homemade bread recipes? Check out these favorites! 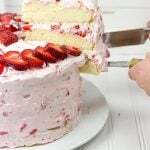 Using an electric mixer, add all dough ingredients and mix on medium speed until smooth. Place dough on a floured cutting board or countertop; roll into a 22” x 10” rectangle. 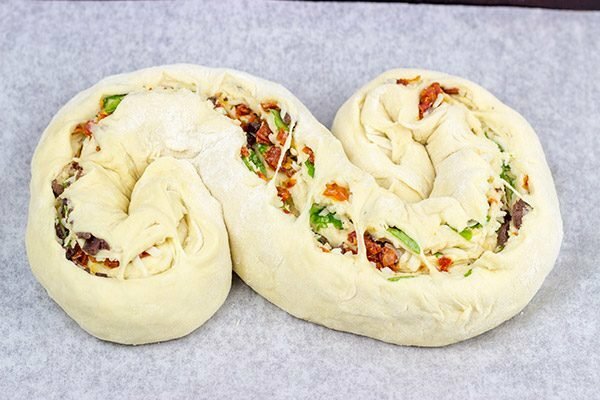 Spread mozzarella, Parmesan, sun-dried tomatoes, olives, garlic and basil across top of dough. Starting with a long edge, roll dough into a tight log; pinch edges to seal. Place log seam-side down on a parchment-lined baking sheet. 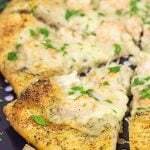 Using a pair of kitchen scissors, cut a 1” deep slice lengthwise down center of dough, starting ½” from one edge and ending ½” before other edge. Keeping cut side up, shape dough into a large “S” shape. Tuck both edges under to create a “Figure 8” shape; pinch ends together to seal. Cover dough lightly with plastic wrap and place in a warm location for 45 minutes, or until approximately doubled in size. Using a small bowl, whisk together all topping ingredients. 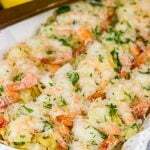 Remove plastic wrap and brush top of bread with the olive oil mixture. Bake for 38-40 minutes, tenting with foil after 20 minutes to prevent top from burning. Love baking bread too! The process is so relaxing and the smell is just divine! Love this fancy stuffed version, David. There is no going wrong with all those flavours you have goin’ on. I’m pretty sure this and a glass of vino and I’d be set 🙂 Pinned! Have a wonderful week! I couldn’t agree with you more, Dawn! I absolutely love baking homemade bread. I don’t do it as much now that Robbie is here…but that’s no real excuse. I just need to make time for it! And as far as that glass of vino with this bread? Done and done! 🙂 Hope your week is off to a great start so far, my friend! I am dyyyyying thinking about tearing into this loaf. Bread is my FAVORITE thing to bake (just not to photograph) exactly for the reasons you list. It never ceases to amaze me that a few ingredients can create something so incredible. But you’ve taken homemade bread to a new level. Cheese and olives and garlic baked right in. . .yes times a billion. I’m adding this to my must-bake list! I agree with you about photographing bread, Kelsie. I’ve had some luck in the past, but more often than not it just never turns out like I picture in my head. But that doesn’t stop me from eating it! And this version with all of those add-ins? So tasty! It didn’t last long around here…haha. I hear ya about waiting til the temperatures break to fire up the bread oven. 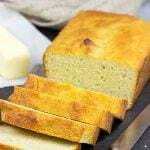 But sometimes you just need homemade bread! I’m not excited about the end of summer, but I am excited about the return of Autumn temperatures…and more bread baking! 🙂 Thanks so much, Kathy! WOW. I just printed your recipe. What fun this would be when the kids came over?!! (My kids are in their 30’s!) They might even be older than you! I’ve never seen anything like this. You did a great job. Hmmm…I bet I have your kids beat by a couple of years, Mimi! But, yes, this would be a fun bread to make with family/company in town. Just serve it warm with a bottle of good wine. 🙂 Yum! I hope you enjoy this one as much as we did! Per l’amor di Dio ! David ! Fabolous ! Hi David! This bread is making me hungry! I love the way the house smells when bread is baking, but the best part is when it comes out of the oven! I think this would be easily adaptable to a bread machine using the dough cycle. And I have everything on hand to make it! The only problem I foresee is exercising enough restraint not to just sit down and pig out! David! I’m all over this bread! It looks and sounds like a dish my family would just love and ask for again and again. I can’t wait to give it a try! Thanks for the recipe, and instruction! I absolutely love homemade bread, Laura! Seriously. It’s probably my favorite thing to make. I just haven’t made it in a while, and I really need to fix that. This stuffed Italian bread is a great way to get back in the game, though. So tasty!! 🙂 Thanks so much, my friend! As you know, I share your love of baking bread. I love it for the same reasons you do, but also because it’s such an ancient idea, done still in more-or-less the same way that it’s always been. The only problem is that I can’t stop from eating a whole loaf! 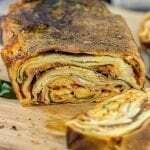 I’m sure I’d gobble this stuffed Italian loaf in a second. Yes! I agree with you completely, Jeff. I remember reading about the history of bread in a recipe book one time, and it’s fascinating. The whole concept of wild yeast and cavemen (or at least humans at that time period) discovering yeasted breads by accident is so cool. But I have the same problem as you…I can’t stop eating it! Cheers, my bread baking friend! I bet Lynne would be quite happy if she walked in the door tonight to the smell of freshly baked Italian bread! You should do that, Neil. 🙂 And you should stuff that bread with cheese and olives. So good! And I bet it would go well with a Talisker…because after all, doesn’t everything go well with a Talisker? Haha! Dude, I don’t care what you call this -this loaf is simply GORGEOUS! So love how that slice down the middle revealed the insides so beautifully after that second rise! Wow! What a stunner of a loaf! I love baking bread – though I love eating homemade bread more than I do baking it and Lil S and I are slowly getting back into our old bread baking ways so I’ve gotta keep this one in mind! Those sundried tomatoes alone would be so flavorful but throw in the garlic AND olives and WOA – Swooncentral! Next time we visit, lets have this? I’ll even get lil S to help you make it and I’ll clean up – deal? Why thank you so much, Shashi! As you know, I love baking bread, and it was so fun to get back to it…it had been way too long! And the unique way of cutting/shaping this bread made it a really fun project. Of course, eating it was more fun…but still! David, that looks so good. 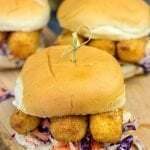 I love the use of buttermilk in the dough and honestly the fillings are some of my favorite things all by themselves. This one definitely goes in the “try” file. By the way, as you know, even ugly bread can be fantastic — but this is beautiful. Kudos. Hey Bill! I’m with ya on the fillings in this bread. A good olive salad is hard to beat, and that’s pretty much what this is…just rolled up in homemade bread! I mean how can you go wrong there?? Thank you so much for stopping by and commenting, my friend! We’re on the same boat! I do love the art of making bread although the waiting game takes forever. But I love how we can play with the dough, just like this stuffed Italian bread. That looks simply gorgeous and I bet your kitchen smells delicious with freshly baked bread. I have to wait until I know I’ll be around the house for the whole day whenever I make bread. In the summer, that doesn’t happen as much…but when colder days arrive? I’ll have plenty of time indoors! And I suspect this stuffed Italian bread will show up quite frequently! 🙂 Thank you so much, Linda!! This bread not only looks delicious, but it looks cool. 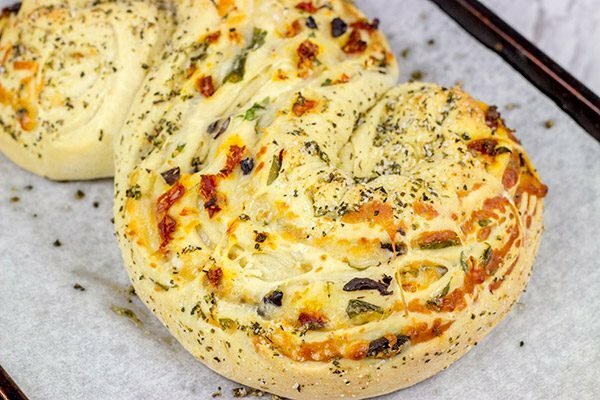 I love making bread, this is something I really need to try. Love it! Yes! You definitely should pin/save/etc this recipe, Dawn. Not only is it fun to make with the unique shape and cut, but it tastes amazing, too. 🙂 The only challenge is not eating it all at one time…haha! Was a huge KA fan when living in the States. Always dreamed of going to one of their baking schools, but never did. I’m not a pastry chef, but I love making bread and look forward to giving this a try. If you ever make it back to the States, Ron, then you should definitely consider one of KA’s baking classes! They are excellent…and of course, the entire baking center there in Vermont is a baker’s playground! I do hope you make this bread, and then I hope you enjoy eating it, too. Cheers, my friend! Yes! You’re right about that, Valentina. This bread does remind me of a focaccia with all of the added ingredients…but it’s just in Italian bread form. It’s so tasty! 🙂 Thanks so much, my friend! This bread looks to die for! I’m with you on this… homemade bread is the BEST! I would make homemade bread every single day if I could eat it fast enough…wait, maybe I can? 🙂 Haha! Thanks so much, Nicole! We. haven’t had a stuffed bread in so long and this one is a real winner.